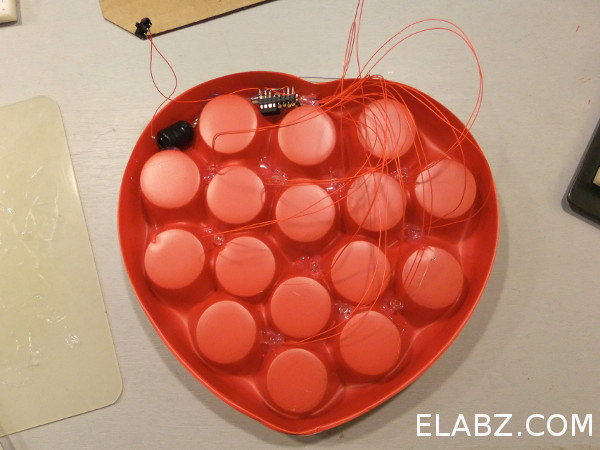 Dress Up A Boring Box of Chocolates with Arduino-Controlled Lights #Arduino #MothersDay « Adafruit Industries – Makers, hackers, artists, designers and engineers! I’d like to introduce an electronics project that came about as a result of my reluctance to throw away a nice looking empty box. This year Valentine’s Day came around just about the time I was playing with ATTiny13 micros – I was setting my Arduino IDE up to be able to write code for and burn the program into smaller 8-bit AVR MCUs like ATTiny13. Once the box of chocolates has been freed of its original content by my dear wife Tanya, on the way to the trash I turned it over and realised that there’s a lot of space available inside the plastic insert. I could easily tuck a battery, an MCU and a bunch of LEDs in there for a nice blinking light effect. By counting the possible spots for LED locations in the box, I decided I should use 10 LEDs. In the course of construction it turned out that a couple more could be mounted but 10 LEDs was the starting point for this project. ATTiny13 has only 5 I/Os (if we leave the 6th as RESET so we can more conveniently program it) and so Charlieplexing was used for connecting the LEDs. Charlieplexing is a technique that uses the fact that LEDs are, indeed, diodes and only light up when the current is flowing in one direction. In addition, it is making use of the fact that MCU I/O pins can be switched into a high-Z state (no current flowing in either direction). So, by manipulating the voltage of the outputs and enabling or disabling them when heeded, we can control up to 12 LEDs using only 4 I/O pins. Pretty clever and crafty technique names after Charlie Allen of Maxim Integrated Products who has proposed it first….